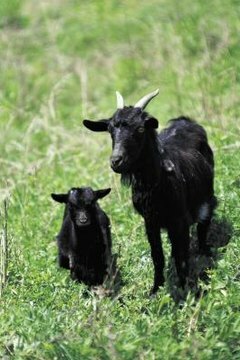 Sheep and goats have slightly different breeding cycles and pregnancy progression schedules -- goats have cycles a bit longer and embryos that implant slower -- but both animals have their babies after the same length of time. Most ewes, female sheep, and does, female goats, are mature enough to start breeding when they are less than a year old, usually around 7 or 8 months. Sheep and goats typically stay pregnant for about five months, they average 150 days for each pregnancy. Some deliver as early as 142 days, and some take as long as 155 days. If your sheep or goat gets pregnant August 6, she should deliver around January 1. With a variance of several days, it's hard to know for sure when your ewe or doe is getting ready to deliver. Watch for her udder to become firmer as it fills with colostrum, and for her to seek an out-of-the-way place to separate herself from everyone. You might notice her acting restless or walking around with her tail up. These signs can begin occurring days or weeks before delivery, so it's best to keep a close eye on her after day 142. A good way to tell if your sheep or goat is pregnant is to keep up with her heat schedule. If there's no sign of heat when it should take place, it's probably because she's expecting. Take special care to make sure she's not stressed and is fed well for the first part of her pregnancy while the embryo is working on implanting. This takes about 21 days after conception for sheep and about 52 days for goats. The pregnancy is a bit more secure after the embryo is firmly attached to the uterus. According to the Alabama Cooperative Extension System, about 70 percent of the baby's growth happens in the last 50 days of pregnancy. That means during the last couple of months your ewe or doe is pregnant, she needs extra food -- she's eating for two, three or sometimes four, after all. Multiple births are common among sheep and goats. If she doesn't get enough to eat, the babies can be too small to survive, or she won't be able to produce enough milk to help them thrive after they're born. Sheep and goats tend to go into heat during the late summer and early winter. Sheep usually go into heat an average of every 17 days from August through December. For goats, it's every 21 days from July through December. A fairly short window of opportunity exists for breeding -- between 24 and 36 hours. This typically occurs the day before the new breeding cycle starts. For example, if your ewe's body follows a 17-day heat cycle, she's most likely to get pregnant on day 16. Ewes and does won't try to mate on days they're not fertile, but it's best to know the cycle so you can put the ladies with the guys on the right day.